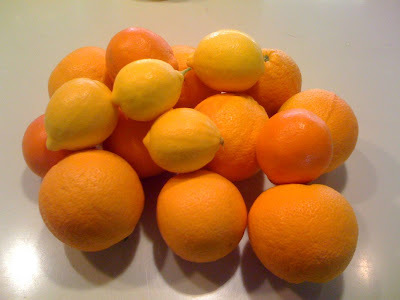 On Friday I found myself with an abundance of citrus. I had minneola tangelos from a CSA box two boxes ago, I had Meyer lemons from my mom's trees, and most importantly, I had a bounty of oranges that a coworker had grown and brought in to share. Friday was an "off" day for many of the people in the lab, so there weren't many people at work in the first place. Late in the day, most of the oranges still hadn't been touched, so rather than have them sit all by their collective lonesome over the weekend, I brought home nine of them with the idea that I would make marmalade. I'd never made it before, so I had to look around a bit for the recipe that looked the most promising. 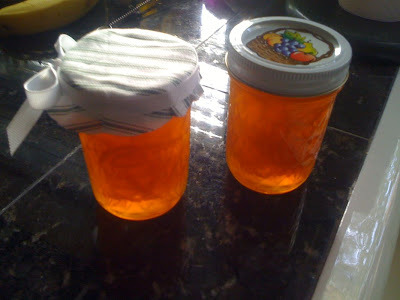 In fact, I'd never done any canning on my own, only helped my mom when she was making jam, so the prospect of canning my own marmalade was doubly exciting. The results, I am happy to say, are excellent. The marmalade is a beautiful color (the picture above doesn't do it justice), well balanced (sweet and a bit tart, with some bitterness from the peel), jelled but still spreadable, and just plain delicious. I was worried that it would not set up properly, as it remained fairly syrupy on the stove and I wasn't sure if I'd gotten enough pectin out of the seeds and pulp. In the end, though, it was fine. The recipe I used is a minimally modified version of this recipe, which has you make your own pectin rather than add store-bought pectin. As I am very much a by-my-bootstraps kind of cook, this method is preferable to me, but you could use added pectin if you so preferred. Wash the fruit, scrubbing carefully, and pat dry with a clean towel. Peel the fruit. If you are particular about the appearance of your marmalade (as I am), try to remove the peel in long, quasi-rectangular pieces. This will make for more even peel bits in the finished marmalade. 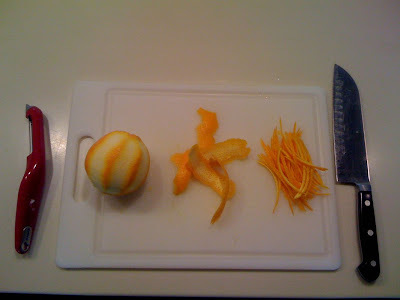 Using a sharp chef's knife, julienne the peel (see below*) and set aside. The two reviewers who've sampled my marmalade agreed that julienned peel is preferable to coarse pieces, as it remains "present" in the marmalade without overwhelming it (and without being something you have to work around). Cut fruit in half through the equator, and set four layers of cheesecloth over a bowl (or one layer of clean muslin, or the jelly bag). Juice the oranges and lemons. Collect the juice in a large pitcher; collect the pulp and seeds in the cheesecloth. Combine juice and julienned peel in the 5- or 6-quart pot. 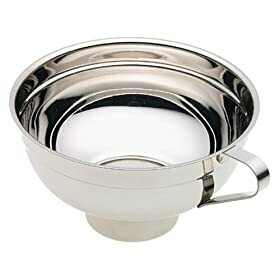 If you are a perfectionist like I am, strain the juice as you pour it into the pot, so that you can retain any pulp that might have gotten through in the juicing process. I just set my cheesecloth (with the pulp and seeds in it) in a sieve for stability, put the sieve over the pot, and poured the juice through the cheesecloth-and-sieve. Use a length of butcher's twine to tie the cheesecloth securely, so that you have a small bundle containing the pulp and seeds. Place bundle in pot, and tie loosely to a pot handle. Bring mixture to a boil and let boil, uncovered, for 30 minutes, or until the peel is soft and cooked all the way through. Remove from heat, and place cheesecloth bundle in a bowl to cool. Using your heat-proof measuring cup (or pitcher), measure out how much orange mixture you have (for this amount of fruit, I had just over 6 cups), then return mixture to pot. Now it's time to add the sugar. Start with 1/2 cup sugar per whole cup of orange mixture, so if you have about 6 cups of mixture like I did, add 3 cups of sugar. Stir until sugar dissolves, placing pot back on the heat if necessary. When sugar has fully dissolved, taste mixture and add more sugar to taste. I ended up using a total of 5 cups of sugar to my 6 cups of mixture. The marmalade was slightly tart while still warm, but the tartness mellowed as the marmalade cooled. Keep in mind also that the sweetness and flavor will intensify as the marmalade boils down in the remaining steps, so be mindful of your sugar. When the cheesecloth bundle is cool enough to handle, start squeezing it to extract the pectin. Grasp a portion of the bag that fits comfortably in your closed hand and squeeze, pulling the bag away with one hand while holding it firmly with the other. Make your way around the bag until, after a few minutes, you have worked all of its contents. For the amount of fruit used here, you should get somewhere between 2 and 4 tablespoons of pectin. When finished, add the pectin to the marmalade pot with the rest of the orange mixture. If you haven't already returned the pot to the heat, do so now (medium-high heat). 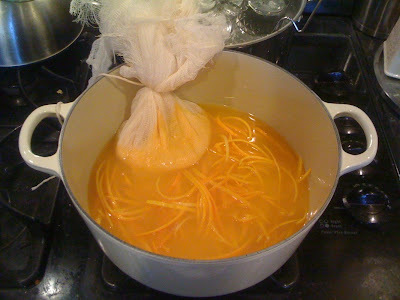 Bring mixture to a rapid boil and let boil until marmalade is "done," which will take anywhere from 15 to 45 minutes. After about 10 minutes, check it for doneness about every 5 minutes. Checking for doneness (that is, whether or not it will jellify when cooled): I've seen three tests described for checking one's jam or marmalade. My marmalade failed two of them, but still set up beautifully, so don't fret too much if it looks like yours won't work. Test #1: The Drip Test. Dip a clean, cool stainless steel spoon in the thinnest (that is, runniest-looking) part of the marmalade. Hold it up out of the steam, sideways, so that the marmalade can dribble down and drip off of the side of the spoon. If two large drips form and then coalesce, the marmalade is ready to be canned. Mine failed this test miserably. It was still very drippy when I canned it. Test #2: The Wrinkle Test. If using this test, place a few small plates in the freezer around the time that you squeeze out the pectin. When you are ready to test the marmalade, remove one plate from the freezer and place a small amount of the hot marmalade on the plate. If it spreads out and looks runny, the marmalade isn't ready. If it moves sluggishly and wrinkles when you push it with your finger, it's ready. Mine failed this one, too: it was sluggish, but there were no wrinkles. Test #3: The Thermometer Test. I like this one, because I'm the scientific type and because it worked for me. The marmalade should be done when its temperature reaches 8-10 degrees (F) above the boiling point. For cooks working at less than 1000' elevation, the "done" temperature range is 220-222F. 1. Sterilize your jars and lids. If you want to be very thorough (and who doesn't?) sterilize the rings as well. 2. Work quickly, but carefully. You don't want to compromise the sterility of your equipment. You also don't want to scald yourself! 3. Be sure to wipe down the rim of the filled jar before you place a lid on it. Any bits of jelly remaining on the rim will interfere with the sealing process. 4. After you have screwed the ring tightly onto the lidded jar, place it upside-down on a wire rack and note the time (I use a pen and paper for this, as I am liable to forget). After 7-10 minutes, the jar may be turned right-side-up. 5. When you hear a very satisfying "pop!" from a jar, you will know that it has sealed properly. I just love the color of the marmalade, and the fact that you can see bits of orange peel when the light shines through it. It's a bit difficult to tell in this image, but trust me, they're there. * My apologies for the quality of the images in this post. My camera's phone phone's camera is excellent for a phone, but not ideal when it comes to fine photography. But it's what I have at my disposal for the time being, and I thought that some low-quality pictures would be better than none at all. You are just full of awesomeness!! I am duly impressed. I wish I could smell it the the internet. I'll bet it was great on the oatmeal bread. Every year the grocery stores in England carry Seville oranges for about one week -- and I always think about making marmalade. Maybe next year? I will see how my raspberry jam goes. BTW, I saw "California artichokes" in the grocery yesterday and thought of you! Thank you both! I am pleasantly surprised by how well it turned out--especially for a first try. I am a little confused, though: my mom (who loves orange marmalade) says it is just as a good marmalade should be, but my dad (who normally dislikes it) likes it, too. I suppose it doesn't matter too much, as long as people like it. I do wish we could all sit down and share some oatmeal bread and marmalade! California artichokes! They do love it over here. My friend Katie's mom grows the most beautiful artichokes in Big Sur. How would you describe the tart to sweet ratio of your marmalade? Does your Dad like a tart or a sweet undertow to his (generally disliked) marmalade? Also, how long did this project take? Did you read during the boring bits? My neck is still red. I felt a little tuckered out all yesterday -- which I definitely attribute to too much sun. A little makes you feel alive; too much can poison you. We are on the beautiful Texas Riviera next weekend (please insert sarcastic tone) and I will have to slather on the sunscreen -- assuming we are lucky enough to have some sun. You cannot know how romantic "artichokes in Big Sur" sounds to me. I think that they are the most beautiful vegetable. I am grateful to my foodie mother for introducing me to them as a child . . . as I'm pretty sure that most young Texans weren't so fortunate. I will definitely come visit you in California someday and we can break bread . . . and dip artichokes together. I'm on a foodie pilgrimage to the Rather Sweet Bakery in Fredricksburg today. I will report back in a few days! Good luck with whatever you do in that research lab of yours! I would say 3 parts sweet to 1 part tart. From what Dad said, I think his traditional dislike of marmalade has more to do with large pieces of peel than the taste of the jelly. With julienned peel, you get the hint of bitterness from the peel without having to deal with big pieces of it in your mouth. The marmalade took quite a while, actually. It's definitely more time consuming than other preserves I've done or seen done--much more so than the quick raspberry jam! I didn't keep track of the time, but I would say a few hours at least. There wasn't a lot of truly inactive time: while the pot was on the heat I kept jumping up to stir it, check if it was done, and so on. I also had to get my canning equipment set up, and my jars and lids and rings sterilized. By the time I got the jam in the jars, I was also making the oatmeal bread. And while the dough was rising, I went to the fabric store to get a bit of fabric and ribbon to go over the lids! It was quite a day. My mom informs me that the strawberries came in droves to the farmer's market yesterday morning. I had thought it too early, but I'm certainly not complaining! They are a little expensive at the moment ($7-8 for a three-pint box) but I am thinking about making a small batch of strawberry jam next weekend. Artichokes really are lovely vegetables. They look like they're protecting a precious object inside of them. Have you ever seen them bloom? They are essentially giant thistles. We managed to eat at the Rather Sweet Bakery twice . . . plus bring home some orange-glazed cinnamon rolls. I will definitely be discussing TX food quite soon. I have three new (HEAVY) cookbooks to lug home. Thanks for filling me in on all of the above. And BTW, we are under a tornado watch tonight! The air is still, sticky and sultry. My perfect spring day is just a memory now . . . with only a faint sunburn to show for it! Just looked up the Rather Sweet Bakery. Yum!! No wonder you went twice and took goodies to go! I can't wait to hear more about all your food adventures, and your new cookbooks. Tornado watch, though, usually means thunderstorms... right? Here's hoping that by this morning the air has been wiped clean.